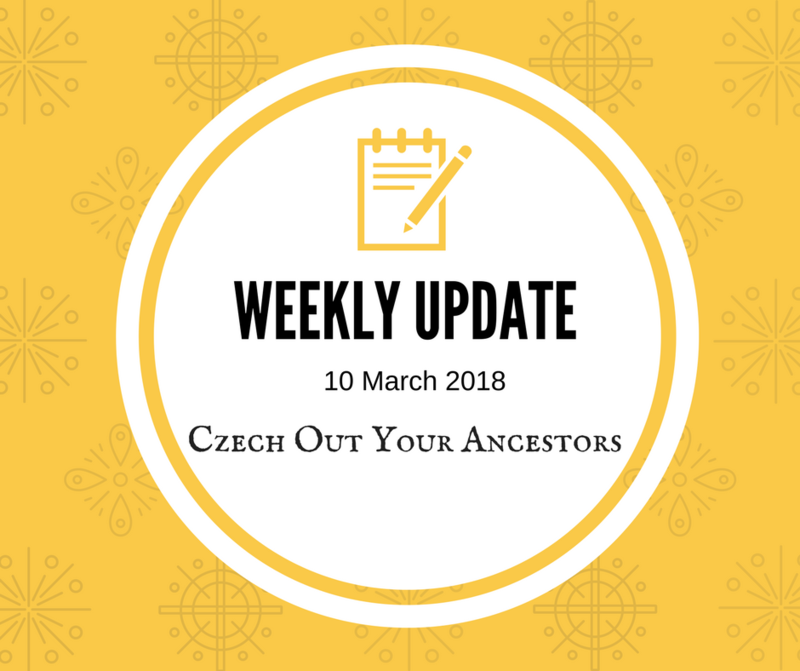 I decided for my own sake I wanted to keep a weekly record of all the stuff I am doing related to Czech Genealogy. This is really just my way of assuring myself that yes, I am accomplishing something, even though mostly it feels like I am not. These updates will be posted on Saturdays. Client Work: this week I finished a client project (hooray! I solved her family’s village of origin! ), did some follow up from a previous project, I sent a referral to another APG member, and I need to write an email to a lady I met at RootsTech. the book I’m writing about Czech Genealogy: I am woefully behind where I want to be on this project. Last night I rewrote the end of a chapter and so even though my progress isn’t really reflected in the wordcount, it still is progress. I also spent a lot of time thinking about it. The client project that I did was helpful for chapter 1 (How to find clues to your Czech village of origin). In fact, I used the strategies I wrote about, which made me feel vilified, as if the book will be helpful to others because it was helpful to me. I also did some research by asking some questions to some genealogy groups on Facebook. I am still thinking about how to incorporate the responses. Grundbucherbuch: this is the funny pet name for the land records book I am co-authoring with Lukáš. No recent news for this project except that last week’s client project helped me to understand the pozemkové knihy much more deeply, which felt awesome. I am more and more convinced that these records hold the true genealogical gold. We also worked a tiny bit on it, so it is slowly moving forward. I am happy about that. Volunteer work for CGSI: I learned a LOT at RootsTech that can help me with my volunteer work for CGSI as the marketing person. The main thing I learned about how to get stuff done seems kind of obvious: be a good communicator. That is very difficult. This blog: Behind the scenes I have been working with adding new contributors, updating some of the about me pages, and of course writing some posts when the muse strikes. Moravian and Silesian Genealogy Facebook Group: I didn’t do much here this week. I like to schedule posts when possible, but it was not possible this week because I’ve been sick with a pretty nasty cold. Instead I just admitted lots of people into the group who promised they would not spam 🙂 Hopefully they will not. Czech Book Club: I wrote a very late post about Saturnin. Most awesome Czech book I have read yet. It might be my favorite book…ever. It was so satisfying to read, even in translation. I also have enjoyed listening to it, though the reader is very, very fast. Narození a smrt: I did not write very much of my own Czech to English translations, but rather focused on making sure we are up to date on the English to Czech translations. I think that now almost every section that I did not translate which is ready for review has been reviewed, commented on, and is awaiting further comments. I have really enjoyed this project and I am excited for its progress. I do not know how to leverage the other contributors besides my friend Tom, whose work I cannot claim to have leveraged – he is just a steadfast worker. The translation is much, much faster when he writes in Czech and I rewrite it in English than the other way around. Still, I want to try again the other way, because it is a challenge. But it mostly ends up as me using google translate and seznam.cz as two giant crutches. I somewhat doubt that it is that way for Tom, though he assured me it is. I think he was just saying that, though. Matriky Monday: I wanted to reboot this series. But I got some feedback that it was not really that helpful: that it was just really too hard, that my readers want something easier, and if they are of the small population of people who does Czech research, who reads my blog, and who doesn’t need much help with transcriptions, well then they just don’t engage at all. The posts themselves are very time consuming to write. so I have started to consider alternative ways to reboot this. Still thinking about it, so far nothing has come out of it specifically. Cesta z Čech až na konec světa: No, this series is not dead! The posts are just really long to write. They are also possibly the most fun blog posts that I have ever written, like ever. I continue to record where I walk/run every day, so I am basically six or seven (or eight…) blog posts behind here. I need to find some time, but client work always takes precedence, obviously. But dang, the time traveling posts are so much fun. So satisfying to imagine and write short plausible scenarios. They are also extremely educational for me – the process of researching these posts helps me to learn many interesting things I never would have even thought about otherwise, and I remember these stories because they are stories. Even though they are mostly fiction. But historical fiction! Geni.com: I was told at RootsTech that if I want to be a curator someday 🙂 then I need to basically be active on this site every day for the next like, year. I started filling out my tree, figured out how I was related to Tom (hahahaha that made me laugh), joined some projects, and mostly made a LOT of merges. It is going to take forever to figure get all my stuff transferred from FamilySearch Family Tree to Geni.com. I am pretty convinced that the benefits of finding new collaborators will outweigh the pain of the learning curve and the boring click click clicking on the green boxes. Czech Genealogy – DNA: I started working on this really interesting DNA collaboration thing but I do not really want to spoil it by writing too much about it so far. Mostly it is in the planning and preparation phases. I also translated a pretty decent sized Czech text into English, yay me. Oh yeah, and I came up with another two really cool ideas for projects but put them on the back burner. THIS IS A HUGE ACCOMPLISHMENT FOR ME, haha. I have to finish some of these other projects first. Sounds like you are busy and are accomplishing a lot, being innovative and have a positive outlook.